Tap water should always be treated before giving it to your reptile to drink, as it contains the residue of chemicals that make it suitable for human consumption. 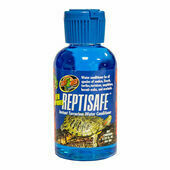 This is not good for reptiles however, so browse our range of reptile water treatments to ensure that they have a clean and safe drinking supply. From trusted brands such as Exo Terra and Zoo Med, our water treatments are easy to use and help to give your reptile the best way to hydrate.